Meeting scheduler tools have taken the sales world by storm. And the popularity is for good reason. Booking a sales call, consult or plain ole meeting was so difficult to do. The busier the people, the harder it is to find a time on everyone’s calendar. If you’ve looked for one of these schedulers for more than a couple of minutes — it’s likely Calendly has come up. They were one of the first in this space and still are a fantastic tool for booking meetings. It’s not surprising, that with their sole focus being meetings, Calendly has the advantage in this category. Payment collection. Not only can you book meetings, participants can pay you money (if hooked up to a processor, like Stripe). SMS notifications to help remind participants of your meetings. Calendly does have a good number of integrations with other marketing and sales tools, but Gist’s advantage is in the all-in-one platform. With Gist’s scheduler, you can use it with our bots, in our live chats, via our email marketing tool and other tools we offer for one price. That said, Calendly is the better meeting scheduler. Calendly takes the win here, big time. If you’re only looking to add a meeting scheduler to your current stack, it might work for you. Live chat is exactly what the title states — the ability to have conversations on your site with visitors while they’re on your webpages. Calendly doesn’t offer live chat. Without a feature to compare, the live chat win goes to Gist. If you have an e-commerce store, software (or SaaS, or any medium to high-volume business — a help desk can seriously help your support team. This is another feature not offered by Calendly. Without a customer support feature, this category goes to Gist. Complicated products or procedures that are poorly understood can lead to low conversions, high churn and fewer customers succeeding with your brand. A knowledge base is a series of articles in a database which explain individual elements and features of your products and services. At this time, Calendly doesn’t offer a knowledge base feature. Gist’s knowledge base is the winner here, especially with nothing to compare from Calendly. Chat bots are perfect for businesses who want a crafted, interactive experience on the most important pages of your website (or important features in your app). Gist gives you the ability to create intuitive bots that perform loads of different interactions with site/app visitors. With Calendly’s focus on meetings alone, they do not offer a chat bot feature. Bots are a marketing tool that will become increasingly important and without a tool to compare, Gist wins. Building, growing and nurturing a quality email list is so crucial for virtually any business type with an online presence. Broadcasts: Newsletters, one-off announcements and in-the-moment emails. Drip Campaigns: Set up a series of emails for certain segments or your entire list. Behavioral Emails: Create emails that can be sent out when subscribers perform certain behaviors (on your site, in your app or in an email you sent). 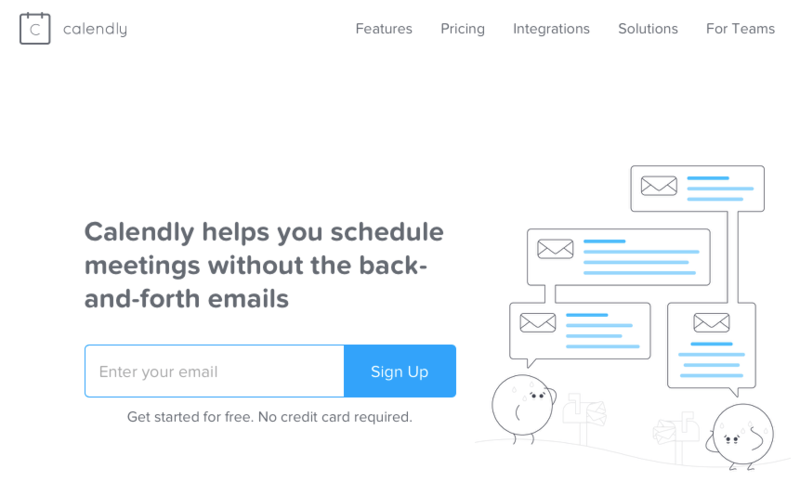 Calendly does not offer an email marketing feature. Email is still on top in terms of staying in touch with your target audience and thwarting off the reduce organic reach from third-party platforms. Gist wins email marketing. Ensuring a consistent process: You can trigger emails to be sent based on any number of events and tags that you create. Automation ensures your entire customer base gets the same experience. Being in the right place, immediately: When a certain button is clicked or email is read, being able to trigger the right response is critical. You can tag a subscriber, send them an email or notify your team that something important has occurred. Tracking key metrics: Marketing automation, used in conjunctions with event tracking can give you an incredible look at how users interact with your site. Segment and organize these users in any way you can imagine. Gist’s marketing automation allows users to set up triggers, based on events and tags (that you also create). Actions can be set for each trigger to automate a number of events. Calendly does not offer automation. Using automations can really help alleviate the number of people handling mundane tasks that can be forgotten and handled poorly. Gist wins this category. 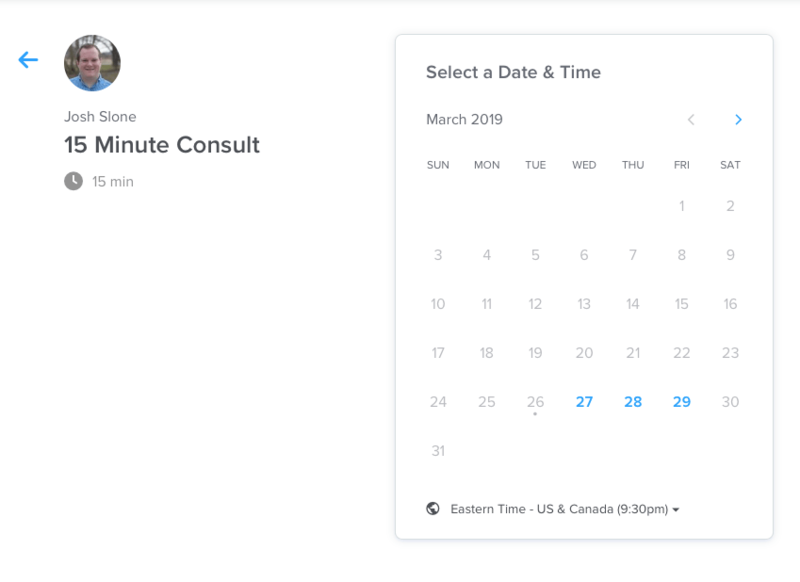 Without email or automation, Calendly doesn’t offer a forms feature. Our forms open up a world of list-growth and automation. Gist wins this category. Calendly offers one central product with a few features to compliment that one tool. Gist offers a number of different tools that encompass the marketing, sales and support processes of a business. Comparing pricing is a bit difficult with such different models. In order to review, I’ll list the details and give some thoughts. Basic (Free): Unlimited meetings, one type of meeting (one-on-one) and a personalized link. Premium ($10/mo): All meeting types open up, team functionality available. Pro ($15/mo): SMS notifications are available at this level, the ability to accept payments and a few deeper integrations are unlocked here. Free: Gets you live chat, meetings and up to 500 contacts. Standard ($29/mo): This level opens up the ticketing system (help desk), knowledge base, qualification bot and up to 2500 contacts. Pro ($79/mo): The Pro plan includes everything Gist has to offer. The entire all-in-one platform. You also get up to 2500 contacts ($10/mo for every 1000 after 2500). Essentially, both free plans get you meetings. Calendly’s scheduler is better. But with Gist,’s free plan it’s like combining Calendly, MailChimp and a live chat tool — in one dashboard. Gist wins the pricing here. There are probably businesses or roles out there that are booking a large number of meetings with multiple members in those meetings. High-volume, multi-participant meetings would probably be better suited with Calendly. However, most businesses can harness their entire process of marketing, sales and support with one platform for a single price. Gist offers a number of different tools that Calendly will likely never offer. While their meeting scheduler is great, Calendly does not have nearly the capabilities of Gist.